Here's another pen photo from Christopher R, whose discerning taste in fountain pens has yielded a fine vintage pen collection. This one is of a lovely Sheaffer fountain pen desk set ca. 1951 in Brazilian Onyx material. The sticker price for this gorgeous desk set was $20.00 back in '51, which translates to roughly $180.00 in the present day---a tidy sum! 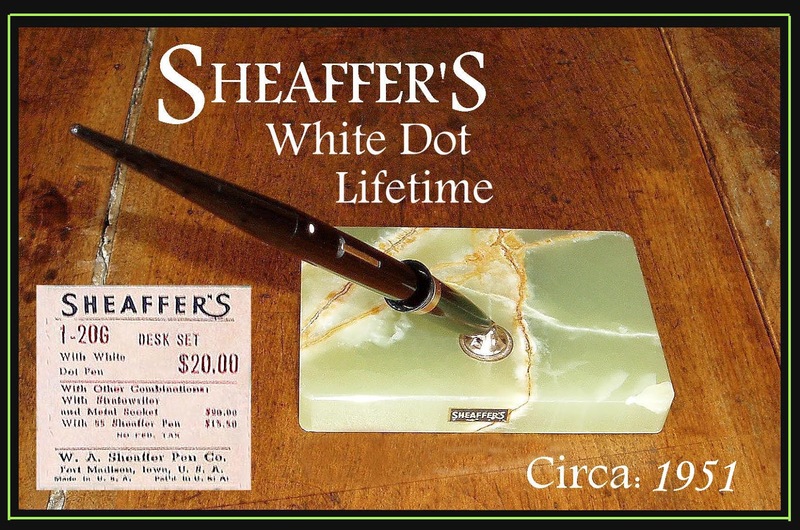 Sheaffer made a lot of desk sets in their day, but this is definitely one of the nicer ones. Many thanks, as always, Christopher, for your contributions to our site!